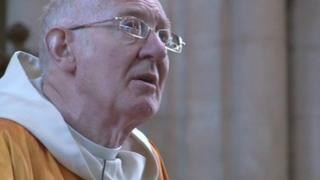 The Archbishop of Canterbury, Justin Welby, said the Church of England had "lost a faithful, hard working and distinguished servant". Bishop Scott-Joynt was known as a strong supporter of traditional marriage and was opposed to homosexuality. Bishop Scott-Joynt was the Bishops' spokesman on constitutional affairs in the House of Lords and also chaired a Church of England committee in 2000 to relax the rules governing remarriage in church for people who have been divorced. Paying tribute, the archbishop said: "With his ability to grasp detail and a remarkable stamina, he fulfilled all the demands made of him with a willingness that made him highly respected, not only in the church but far beyond. "He was not afraid to say what he believed, even when he knew those views might not be popular. But all this he did from his deep faith and after much careful prayer." As the 96th Bishop of Winchester, Michael Scott-Joynt was the post's longest serving incumbent in more than a century. Speaking on his retirement, he said he wanted to be remembered for helping Christian people be "more confident and effective followers of Jesus".